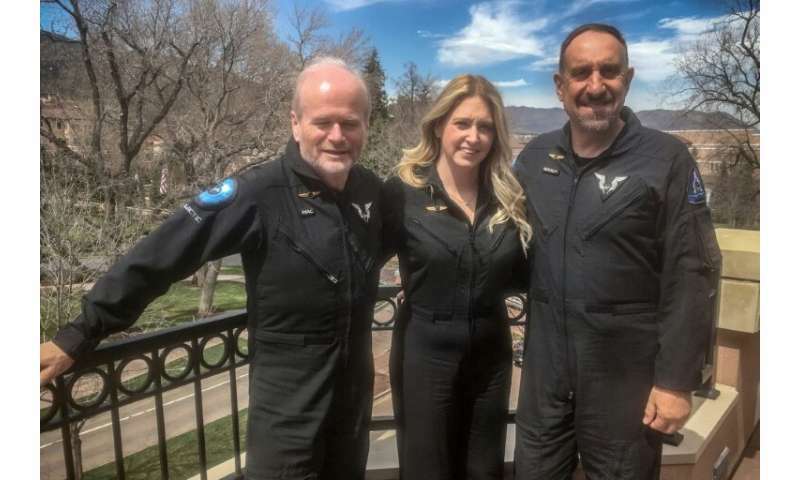 The Virgin employee, who will now train the company's future space tourists, made the vertical ascent propelled by a rocket at three times the speed of sound. "No, none at all, none at all," she told AFP when asked if she experienced nausea during her flight. "I didn't expect to have any, and I did not have any." Virgin Galactic is one of two companies, along with Blue Origin owned by Amazon's Jeff Bezos, that is now hoping to send tourists to space for a few minutes. Moses' run saw the ship ascend to 56 miles (90 kilometers)—technically space, according to the US definition, but well below, for example, the International Space Station which orbits at a height of 254 miles (410 kilometers). Until now, only astronauts and experienced pilots had reached this extreme environment, raising questions about the physical effects of the journey on ordinary passengers, space rookies. "It's a very intense experience," explained one of Virgin's pilots, Mike "Sooch" Masucci. At first, the spaceship enters a few seconds of free fall after it is released from a carrier plane at an altitude of eight miles (13 kilometers). Then the ship's rocket engine fires, and the acceleration rises to 3G, three times Earth's gravity, which isn't that difficult, according to Sooch. "It's like somebody pushing on your chest." After about a minute, the engine turns off, and "it's complete silence," said the pilot. "At that point, we will make a call to the cabin saying, 'Welcome to weightlessness, you are clear to unstrap,'" added Virgin's chief pilot, Scottish-born Dave Mackay. Virgin Galactic clients, hundreds of whom have already paid $250,000, have been waiting years for the start of regular flights to space but the program has experienced delays, particularly after an in-air accident killed a copilot in 2014. The company, owned by British billionaire Richard Branson, is in the process of building a spaceport in New Mexico, where the ship will be based and where passengers, whom the company calls "astronauts," will take part in a three-day-long training session. The first day of their training, said Beth Moses, clients will be taken up in an acrobatic flight so they can experience some "high-gs." The goal is, "when they get to space, they won't wonder, what just happened?" The whole in-space experience will only last a few minutes (Virgin won't give the exact length until the end of the test flights). "At any time, any adult can get a hand or a foot on the edge of the cabin" to stabilize themselves, said Moses. Returning to their seat could be a little more acrobatic: "It does need a little bit of choreography and training on the ground." In the worst case scenario, she says, it won't be dangerous to be out of your seat during descent, which sees the glide to its landing strip. Richard Branson told AFP in February that he'll be on board a flight before July, but he has often fallen victim to optimism. "He's always going to have these dreams of when the flight can happen, but there's a lot of other huge exciting milestones that are going to happen before that point," a Virgin spokeswoman said diplomatically.